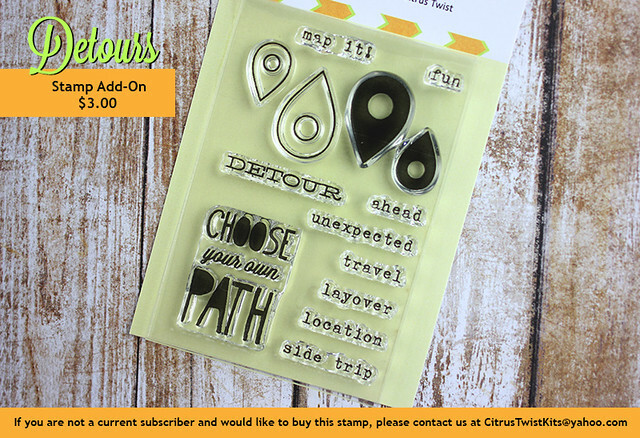 Citrus Twist Kits | Blog : Introducing the August 2013 Kits from Citrus Twist! 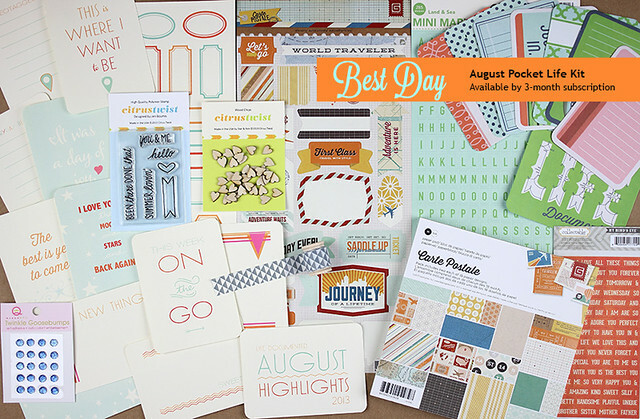 Introducing the August 2013 Kits from Citrus Twist! 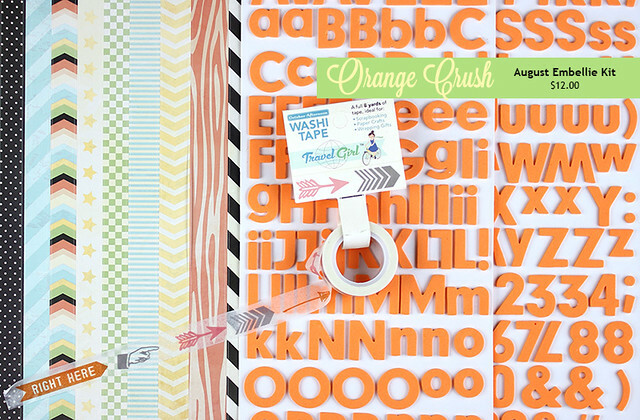 Welcome to reveal day at Citrus Twist Kits! As a mid-month release kit club, reveal happens monthly on the 12th and kits begin shipping on the 15th. This month we have a new subscriber special: sign up for a Main or Pocket Life (PL) subscription and get an embellie grab bag ($20 retail value) thrown in. For those newcomers to Citrus Twist, when you subscribe for 12 consecutive months you get your 13th kit free, just paying shipping on your free kit. To subscribe, first register on our site then visit our Kits page here: http://citrustwistkits.com/kits . 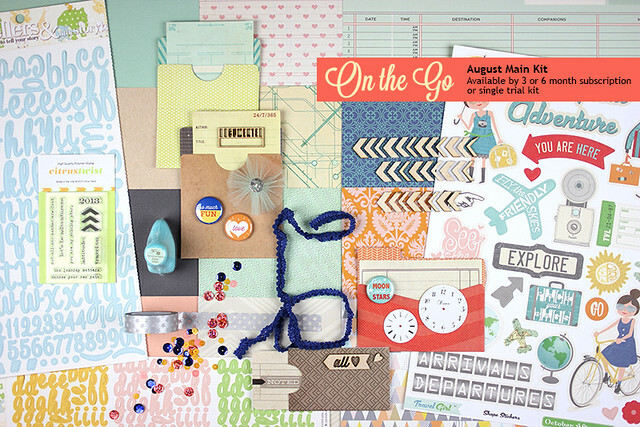 Here is the reveal of our August Main scrapbooking kit "On the Go." We are loving the versatility of this kit. Some of the double-sided pattern paper is travel themed, while the flip side of those travel patterns are non-travel gorgeousness. We can't wait to see what you do with this kit. We even have a challenge going this month: We want to see how you use this kit for travels through your everyday life. This month's Pocket Life (PL) kit named "Best Day" is filled with lots of goodies to play with, including 12 exclusive 3 x 4 PL cards. You won't get bored with our PL kits! 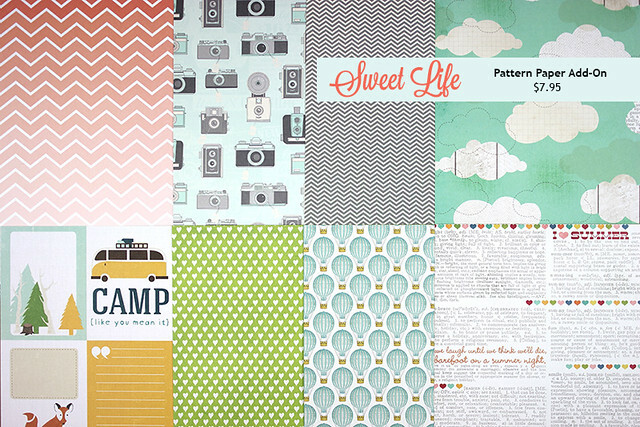 We are loving the Jen Boumis designed Pocket Life stamps in our PL kits this summer. Jen is one of our talented PL designers and she designed an exclusive line of PL kit stamps to feature in our PL kits June-August. Thanks to Jen's for sharing her wonderful handwriting with us! 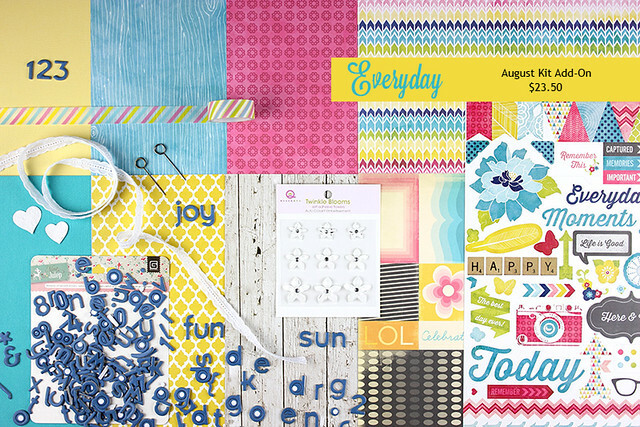 Our "Everyday" Kit Add-on is a full kit with bright, fresh colors and an alphabet chip set that keeps on going! Every month DT Girl Melissa Stinson shares a video reveal of our kits. Have fun watching Melissa's tour of our August kits. We look forward to seeing your designs posted in our gallery!